On behalf of Terry McGee and his team from PC Flight Magazine we’re pleased to inform you that there’s a new March 2019 edition. 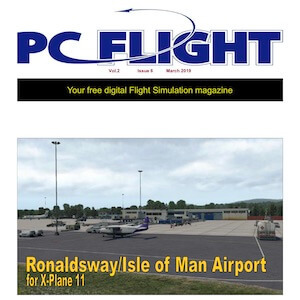 Keep in mind that the free magazine is not only related to X-Plane 11 related articles, links to interesting free airports and so on. This time there’s no X-Plane related reviews included. The rest, and I have to say the majority, is related to FSX and P3D articles including hardware. So actually this edition is all news related to all flight simulator programs.